A day on the beach, a trek in the mountains, a drive along the pretty coastal or winding mountain roads….we’re never short of things to do and places to go in the P-O. 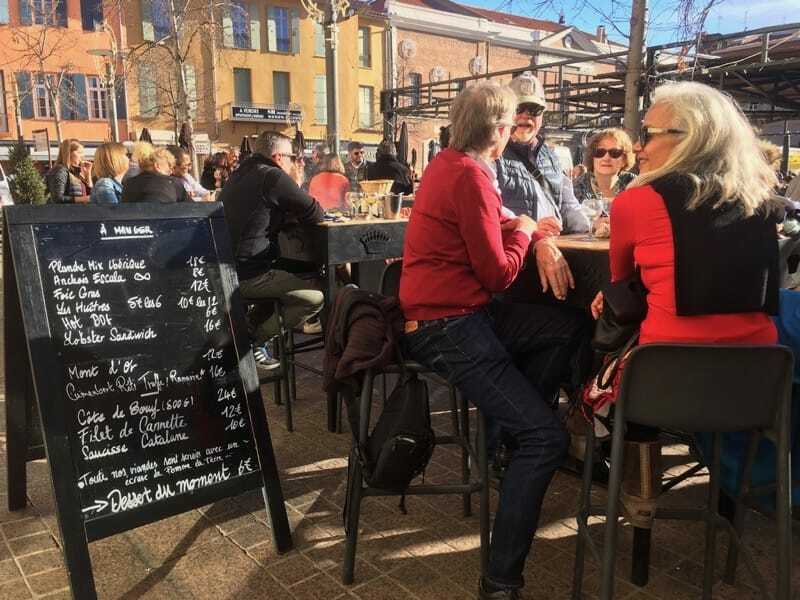 Today however, we’re out on the town for a wander around a few of the delights of historic Perpignan with its colourful mix of old and new, chic and shabby, trendy boutiques, narrow, cobbled streets and small intimate bistros. 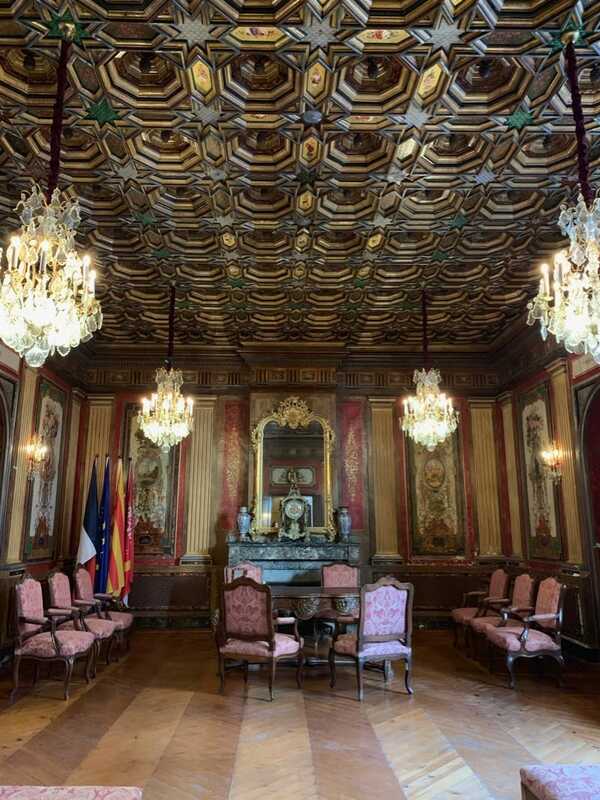 A thirty minute drive from the Spanish border, this cultural capital of Catalonia North owes much of its heritage and cultural development to the kings of Majorca, whose palace still dominates the town. 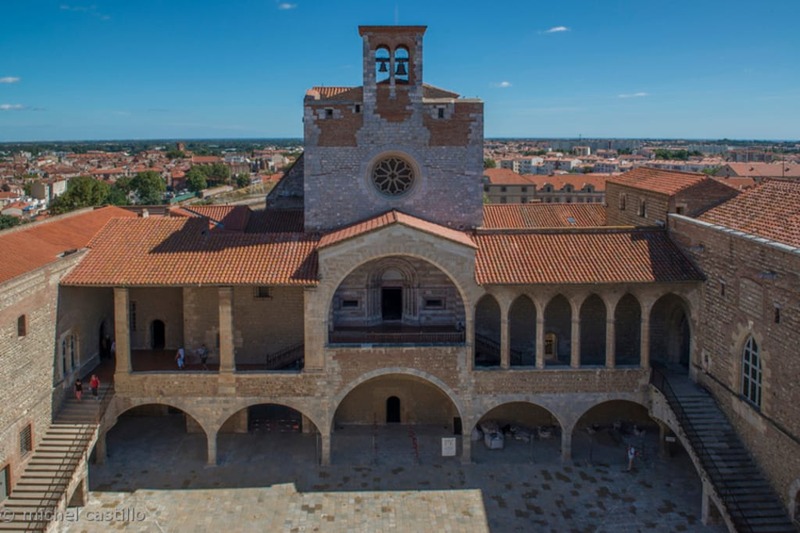 With beautiful chapel, some rather austere royal apartments and a grand courtyard, the palace is very slightly off our city centre circuit today but a must-see another time, if only for the superb view from the impressive red brick ramparts across the city roofs to Canigo and Queribus. The city walls built by Vauban are long gone, but the XIV century Castillet, our starting point today remains. Gateway, fortress, prison, and today a museum of Catalan History, climb the spiral staircase of La Casa Pairal (entrance: 2€) to the terrace, added to support cannons. The views across the city, the plain of Roussillon, and the sacred Mount Canigo are spectacular. 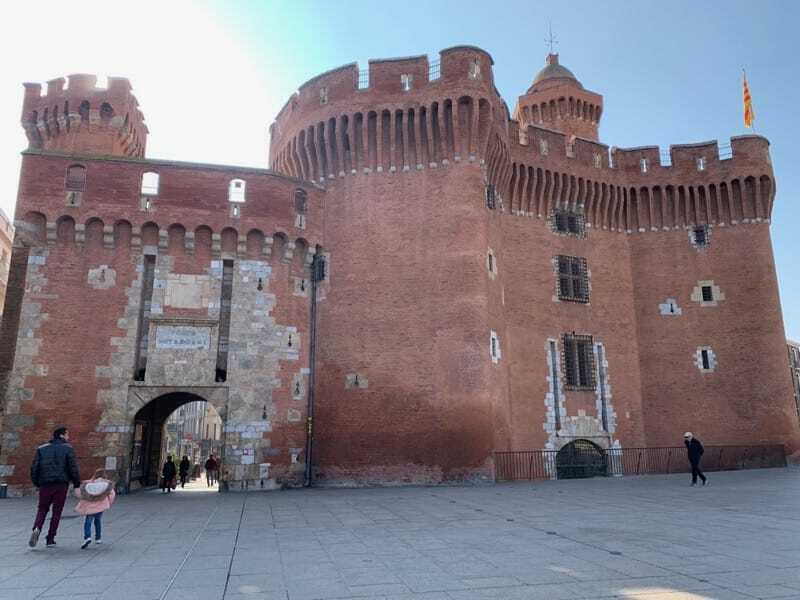 From the Castillet, head along the rue des Marchands towards the place de la Loge, formerly called the ‘Place des Hommes Riches’, and paved with marble. On the corner, the newly located tourist office has replaced the 1397 Loge de Mer, once the Stock exchange and HQ for maritime affairs. 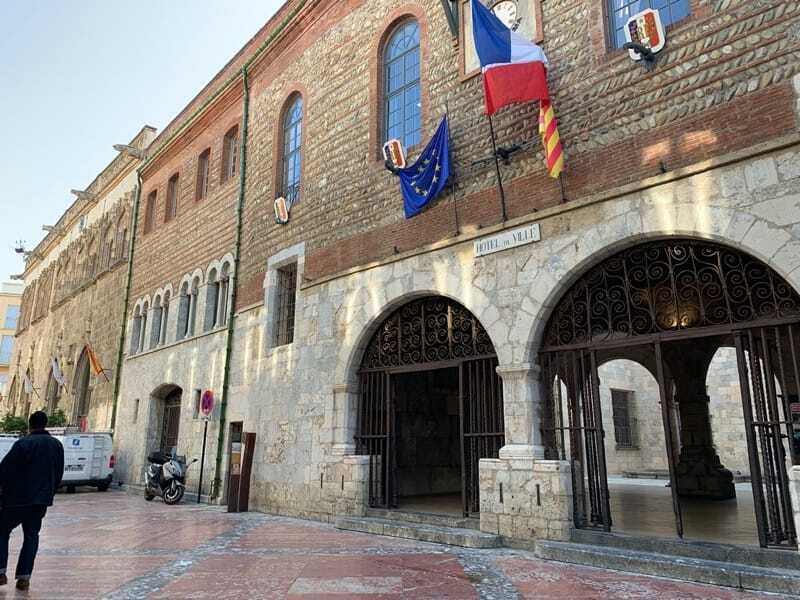 Next door, the XVI century Town Hall has three hands sprouting from the wall, representing each of the main 3 social classes, and their right to vote. 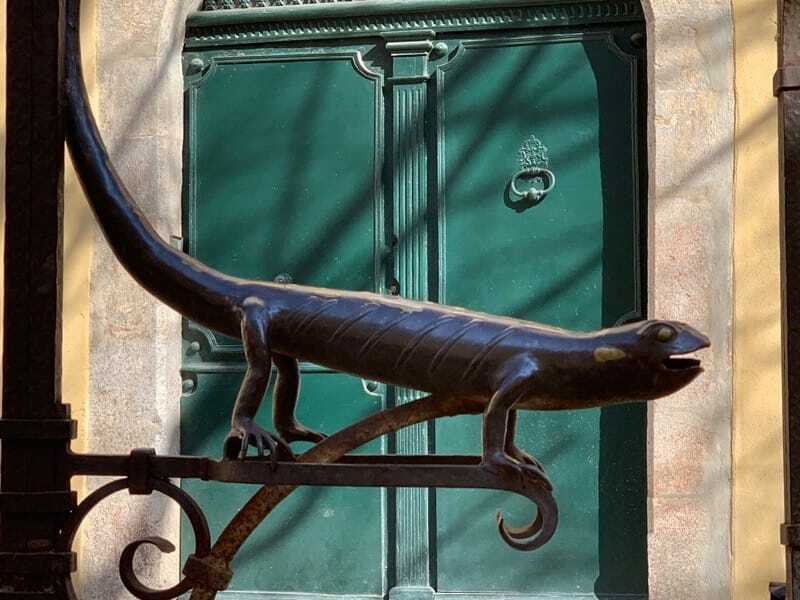 Step through the attractive arched entrance into a pleasant courtyard where “La Méditerranéenne” (also known as ‘La Pensée”), bronze statue by Maillol, sits in a pretty pool. To the left, take a wander around the cool and plush ‘Salle des Mariages with magnificently ornate ceiling, restored in 2008 but originally designed for a visit from Napoleon 1. Next door, the Palais de la Deputation, once the seat of the Roussillon Parliament, was the setting for many a grisly execution. 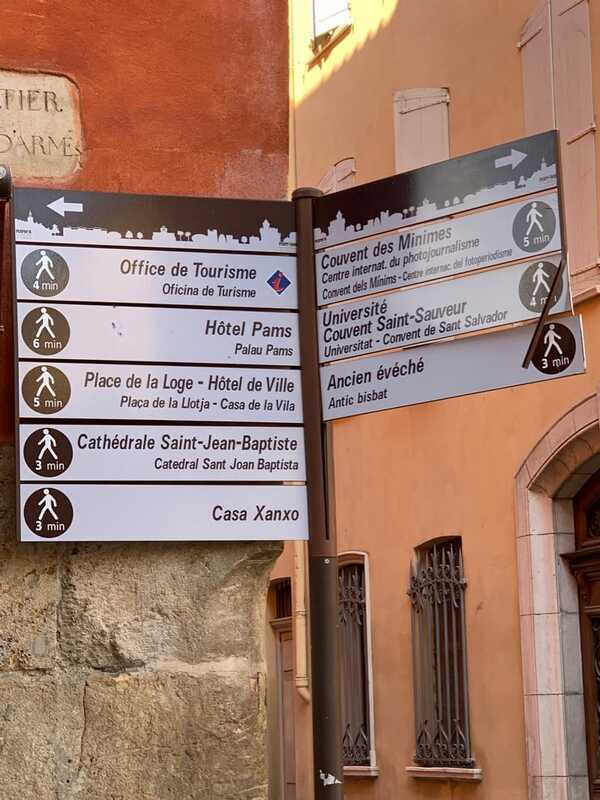 From Place de la Loge, take the narrow Rue Saint Jean opposite the tourist office towards the Gothic Cathédrale Saint-Jean-Baptiste in the pretty and peaceful Place Gambetta. The vast, rather sombre interior houses some spectacular religious art, an impressive 5 XIV century organ and a large pre-roman white marble baptismal font. The original old Romanesque St Jean le Vieux is joined to the cathedral by huge buttresses but is unvisitable. It houses some very secular electricity equipment as well as the tomb of Sanch I. Just a few minutes walk away is the Campo Santo, one of only two cloister cemeteries in France, whose graceful arcades contained the tombs owned by wealthy burghers in the Middle Ages. Today it is an idyllic outdoor setting for open-air concerts, theatre….. 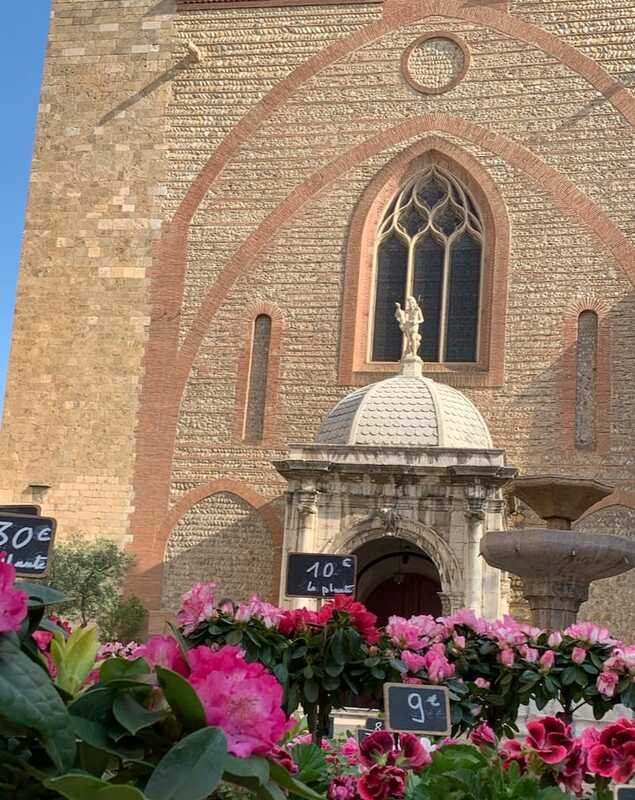 In fact, most religions were represented in Perpignan during the Middle Ages and many ancient chapels and monasteries are now used for exhibitions and concerts. Only a little way off our city circuit, the rambling 15th century Couvent des Minimes is now the International Centre for Photojournalism. Entry is free and fascinating to these all-year-round, diverse exhibitions of photojournalism. Closed for the foreseeable future, but worth beating in mind for a future visit, the Chapelle du Tiers-Ordre de Saint-Dominique in the Place de la Révolution française took almost a century to complete. 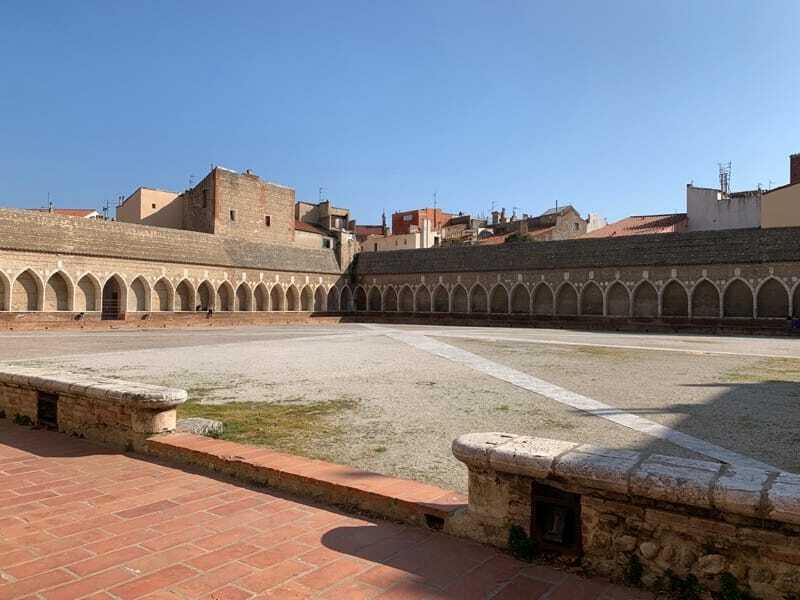 A small courtyard joins it to the Chapelle des Dominicains, until recently, the base of the French Foreign Legion, where the “Trabucayres”, (bands of highwaymen) who terrorised the roads of the Albères in the mid 19th century were tried and condemned to death or hard labour. 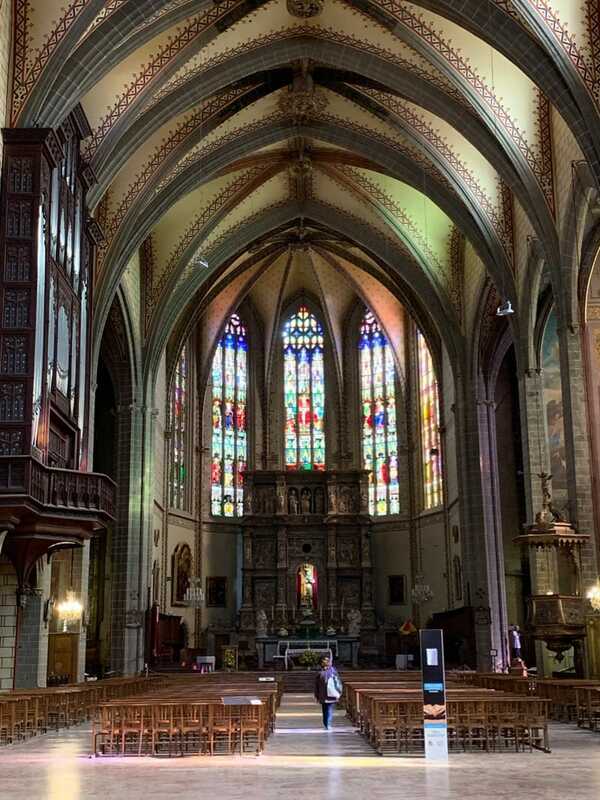 Also worth a visit is the recently restored church of St Jacques in the inner-city quarter St Jacques, a colourful part of the town with mix of native French, North Africans and Gitanes, an area with fascinating ambience, despite its crumbling, impoverished appearance. 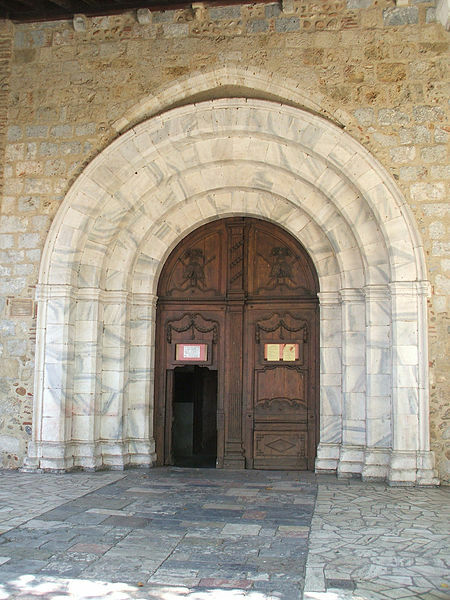 This relatively unknown church dates back to the 14th Century, and the interior is as impressive as Perpignan’s cathedral. 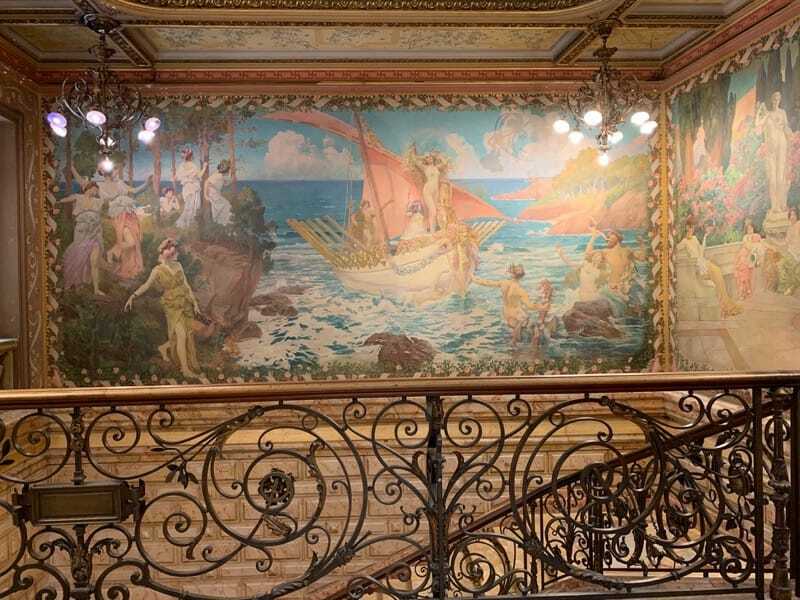 On now to an art deco gem, the Hotel Pams in the Rue Emile Zola, one of several beautiful old ‘hotels particuliers’, elegant private mansions of the Perpignan Bourgoisie. 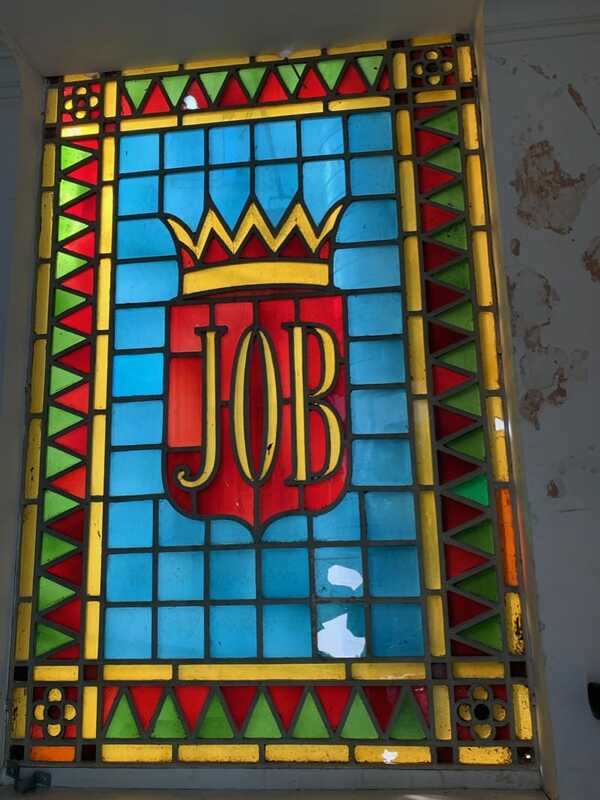 Pierre Bardou of JOB cigarette paper fame bought it along with several surrounding houses in the 1850s. It has enormous Art Deco Pre-Raphaelite paintings on the walls, a stunning entrance hall with an amazing light well, and a delightful hidden garden. Adjoining the house is the old cigarette factory where many people were employed. Entrance is free and it’s a perfect spot to sit a while. 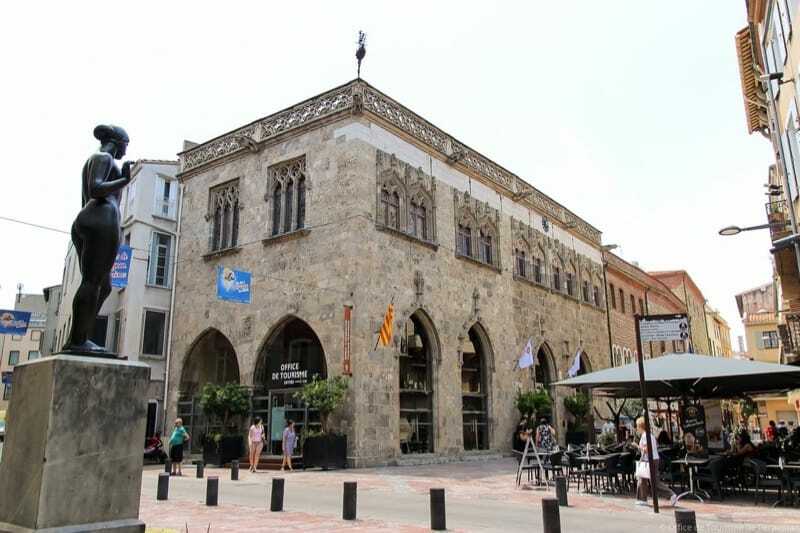 A short distance away from the Hotel Pams is the Gothic Casa Xanxo, house of Art and History, another example of the XVI century wealth of the Perpignan merchants. 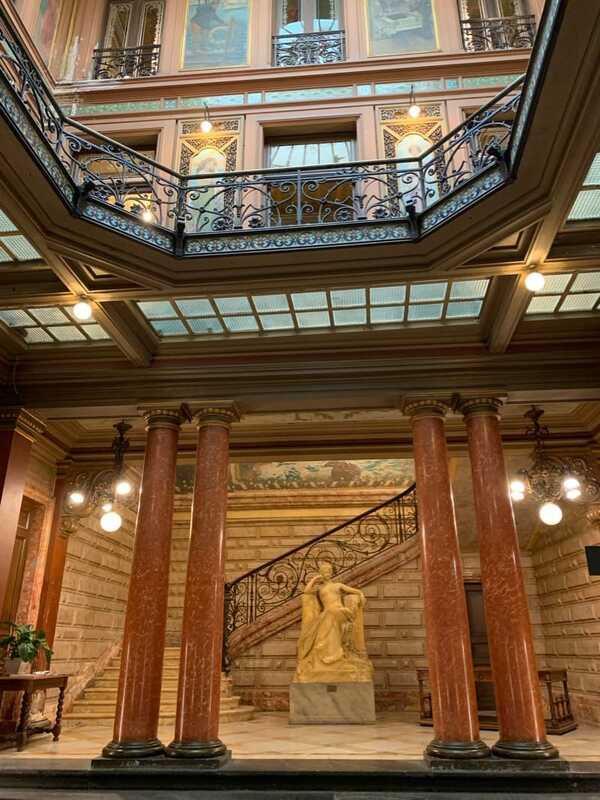 Undergoing long term renovation, admission is nevertheless free to the courtyard and decorative sculpted architecture of the ground floor arched entrance. Our final visit today is the Museum of Beaux Arts Hyacinthe Rigaud, newly-renovated and boasting an impressive array of both permanent and temporary exhibitions. 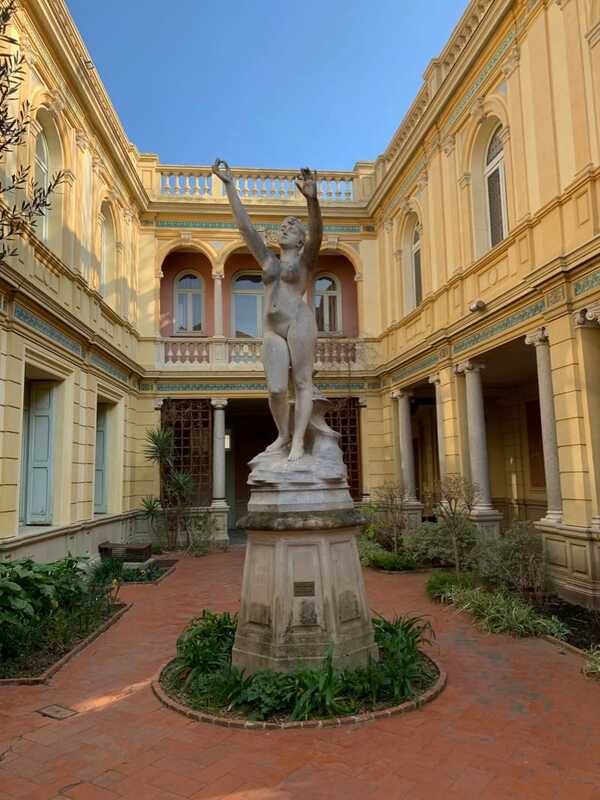 A creative melting pot of Hispanic, Italian, Flemish… and of course, local greats such as the museum’s namesake, Hyacinthe Rigaud, and the revolutionary Aristide Maillol. Time for a cold beer or a frothy coffee? You’ll be spoilt for choice as you stroll through shady and ancient cobbled streets past inviting inner courtyards‚ havens of calm but also surprises, shady terraces and sunny squares, private art galleries, museums, and quirky boutiques. 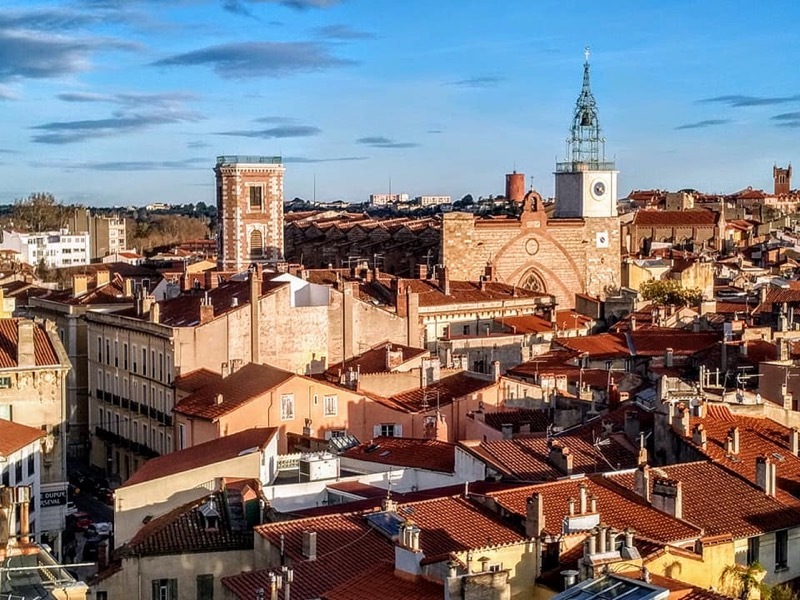 Between festivals, concerts, dancing, theatre, wine, food and ancient tradition, there’s always something going on in Perpignan. Check out the Tourist Office for more info. 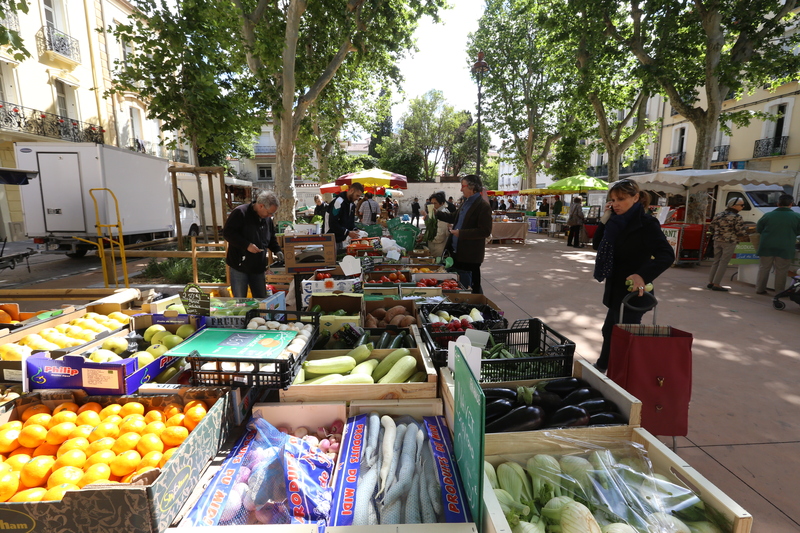 As well as the colourful daily market in Place Cassanyes and the small morning market in the place de la République, there is a flea market every Sunday near the Palais des Expositions and a Bric a Brac market each Saturday under the Plane Trees in front of the Palais de Congrès. 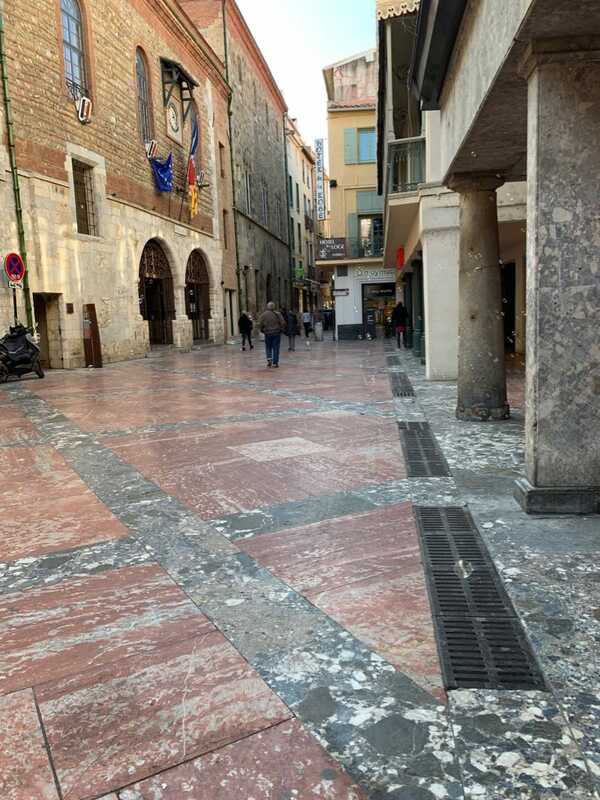 How about doing a bit of ‘place hopping’ around some of the lovely squares in the centre of Perpignan? Here are just a few, worth mentioning for their name, for their history…or just a sunny place to sit on a beautiful spring day. Place Bir Hakeim is a peaceful park just 5 minutes walk from the centre ville. 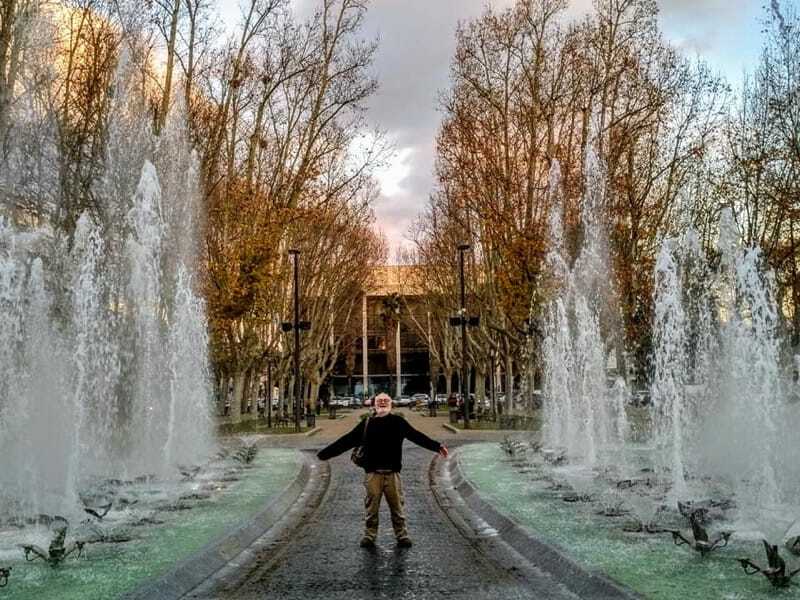 Children’s playground, water features, (look out for the ‘magic fountain’ in front of the Palais des Congrès)and benches make it a perfect place for a bit of time out from the relentless shopping, sightseeing and partying! It was named after a WW2 battle in which the French troops were defeated, although the conflict seriously delayed advancing Italian and German armoured divisions and enabled British troops to win the next important battle, that of El Alamein. 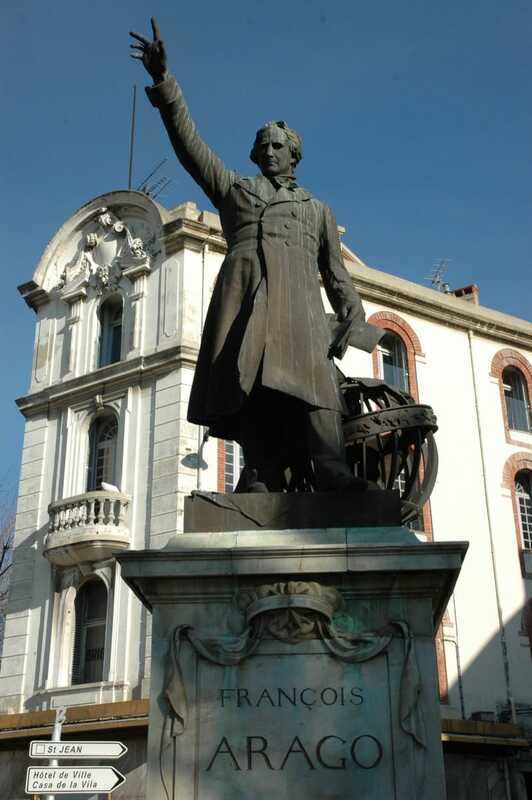 Place Arago is named after local lad François Arago (1786-1853), physicist, astronomer, charismatic adventurer, politician, responsible for the abolition of slavery in the French colonies in 1853 and. He has also had craters on Mars and the Moon, and a ring of Neptune named after him! A pretty line of fountains that you can run through if you’re so inclined, and restaurants for all tastes. Place Cassanyes is named after Canet born Joseph Cassanyes (1758-1843), mainly remembered as a member of the National Convention, (the new administration during the French revolution) who voted to lop off the head of Louis XVI in 1793…but also for his part in the defence of the Roussillon against Spain. 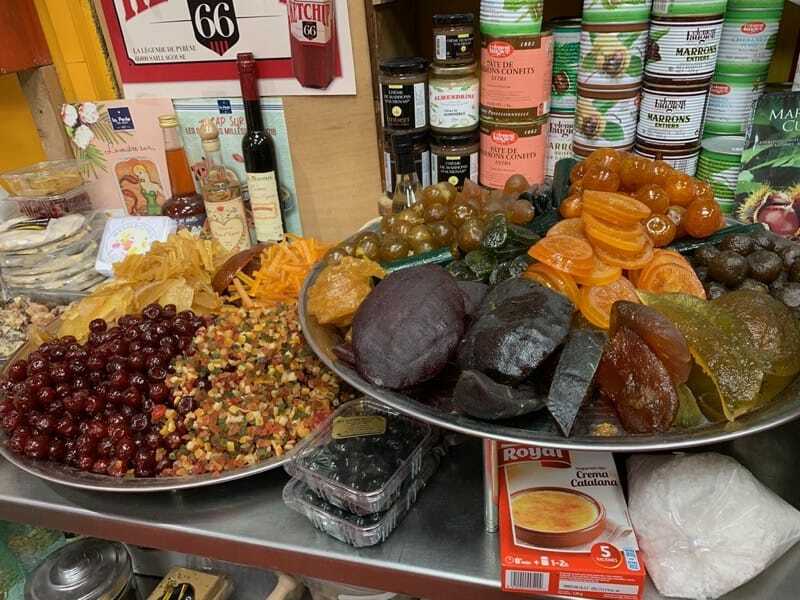 Here you will find the colour, sounds and smells of North Africa on your very own doorstep at the daily market. Place de Catalogne in front of the FNAC as you enter Perpignan from the south has pretty fountains and benches to sit on. 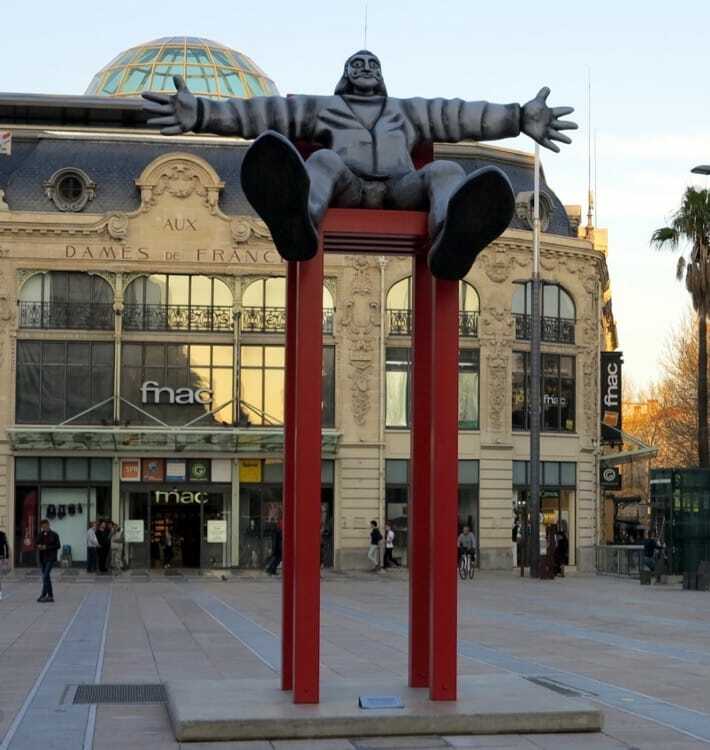 Not really a place to picnic but worth a visit to ’Dali en Levitation’ to see Dali sitting on a high red chair welcoming visitors to the Catalan capital. Place de la Loge, mentioned in detail earlier in this article, bustles with busy shoppers wandering up and down the Rue des Marchands. A couple of well placed bars and restaurants are perfect for people watching. During WW2, this was the meeting place for refugees and escapees looking for ‘passeurs’ to take them over the mountains to the relative safety of Spain. While you’re there, don’t forget to pop into the newly located Tourist Office on the corner for town plans, leaflets, post-cards, info…and a warm welcome. Other ‘places’ include the small Place de la Révolution with its ancient well and bronze lizard, the Place Rigaud with old labour exchange and statue of Hyacinthe Rigaud, the tiny Place des Poilus, named after the soldiers returning from the First World War leading on to the fabulous Rue Paratilla, (named after French pilot René Paratilla, lost in WW1) with colourful morning fish market and every herb and spice you could wish for. 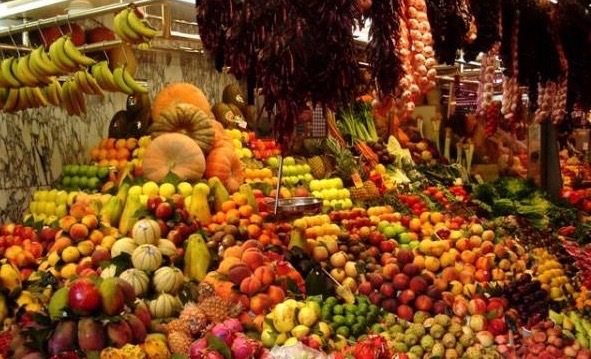 And if you’re just looking for a cold beer in the sunshine and a spot of people-watching, head for the lively Place de la Republique, with its colourful morning market in season; a delightful place to sit, eat, drink, shop and relax.